Barley adds great texture to this simple one-pot soup. 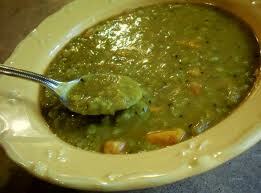 In a large pot, combine peas, barley, water, onion, celery, cumin, basil, thyme, and black pepper. Cover loosely and simmer, stirring occasionally, until peas are tender, about 1 hour. Transfer 4 cups to a blender and process until smooth. You may have to do this in a couple of batches. Fill blender no more than half full and hold lid on firmly. Return to pot, add salt, and serve.